We’d love your help. Let us know what’s wrong with this preview of Short Stories III by Rich DiSilvio. 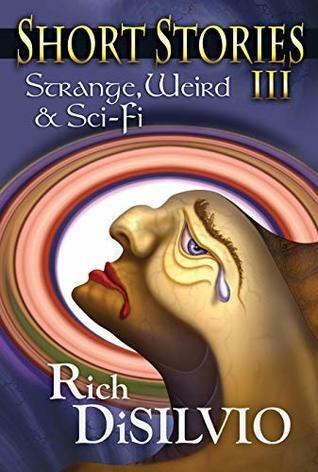 From the vivid imagination of multi-award-winning author/artist Rich DiSilvio comes this spellbinding collection of strange, weird, and Sci-Fi tales. Featuring the chilling, dystopian tale “Adam & Adams”, the probing and disturbingly prescient tale “God’s Mistake”, the riveting and humorous "Life of a Shyster", the poignant yet uplifting tale “The Quest for Immortality From the vivid imagination of multi-award-winning author/artist Rich DiSilvio comes this spellbinding collection of strange, weird, and Sci-Fi tales. To ask other readers questions about Short Stories III, please sign up. Short Stories III: Strange, Weird & Sci-Fi continues Rich DiSilvio’s exploration of literary genres beyond the historical fiction employed in much of his other work. The stories in this volume fall within the realm of speculative fiction and embrace many common themes of the genre: time travel, dystopian futures, and sentient artificial intelligence, to name a few. Some of the stories draw upon the political and cultural climates of the present day. In one story, unchecked prejudices stoked b Short Stories III: Strange, Weird & Sci-Fi continues Rich DiSilvio’s exploration of literary genres beyond the historical fiction employed in much of his other work. The stories in this volume fall within the realm of speculative fiction and embrace many common themes of the genre: time travel, dystopian futures, and sentient artificial intelligence, to name a few. Some of the stories draw upon the political and cultural climates of the present day. In one story, unchecked prejudices stoked by our entitlement culture and identity politics appear to be the ultimate cause of humanity’s self-induced extinction. Other stories do still build their speculative imaginings atop a historical foundation. The Battle of Little Bighorn is a profound influence for one story of the far future, on an alien planet no less! The protagonist of another story is inspired by the work of Nikola Tesla. A particular facet of Mr. DiSilvio’s storytelling that really hits home for me is his emphasis on the arts. In this volume, I enjoyed seeing the illusory work of M.C. Escher highlighted in a Scrooge-like tale on the transformation of a selfish man facing his imminent mortality. Another story is a modern take on the Greek myth of Pandora’s Box, literary art in itself but also the impetus for great works of art in other forms throughout time. An aspect of Mr. DiSilvio’s work that clearly shines through here is his respect and admiration for the 19th century Hungarian composer Franz Liszt. As another emphasis on the impact of the arts in the human condition, the author has always found a way to bring Liszt’s artistic achievements into the storyline. I was happy to see that, even in this volume of speculative fiction, Franz Liszt makes an appearance in what is the most noble and uplifting story in this collection. The author’s own visual artistic abilities are on display as well, with an image collage accompanying each story. The image for the final story, also used for the cover art, I found particularly captivating. It made me wonder what came first, the idea for the painting or the idea for the story? The ways in which a creative endeavor in one medium can spark the creation of something in another is fascinating. A collection of well written 7 stories by the Author Rich DiSilvo. I Have been an ardent follower of his works over a period of time now, I can certainly say that this is something new. Rich has successfully created an amazing new genre that simply highlights one fact – he is simply an amazing Author that understands what it takes to create an entertaining story. The story flows very well and has a way of gradually capturing the reader’s mind. Just as the name implies, there is a touch of weirdn A collection of well written 7 stories by the Author Rich DiSilvo. I Have been an ardent follower of his works over a period of time now, I can certainly say that this is something new. Rich has successfully created an amazing new genre that simply highlights one fact – he is simply an amazing Author that understands what it takes to create an entertaining story. The story flows very well and has a way of gradually capturing the reader’s mind. Just as the name implies, there is a touch of weirdness, strangeness as well as sci-fi in the stories. The Author did well to also give people like me who are enthusiastic about arts something to gaze our eyes upon. Rich’s artistic style is something I can very much relate with. Short stories III has a unique way of triggering some sort of strange awareness and consciousness about our world within the reader. At some point, I began to wonder, what the future holds for our world. There are also a lot of vivid descriptions in the stories. I've had the pleasure of reading most all of DiSilvio's books, and this latest effort of his highlights his excellent skills as a writer and storyteller. This is a new genre for him, as it is for me as well. All of the stories are well developed and hold the reader's interest. Each one offers a redemptive end, which is both edifying and pretty remarkable. The spiritual undertones touched on my moral fibers and presented interesting questions for us all. I believe the short stories would be great I've had the pleasure of reading most all of DiSilvio's books, and this latest effort of his highlights his excellent skills as a writer and storyteller. This is a new genre for him, as it is for me as well. All of the stories are well developed and hold the reader's interest. Each one offers a redemptive end, which is both edifying and pretty remarkable. The spiritual undertones touched on my moral fibers and presented interesting questions for us all. I believe the short stories would be great for groups to read and discuss. This collection of short stories is worth every penny and readers will be highly entertained and motivated to read his other works.